Expressing your condolences to this special person that left many good memories and was such great in our lives. Sao Paulo flower shop .. Send your deepest sympathies with an assortment of beautiful white roses and flowers in glass vase. .. These beautiful white lilies are the ideal way to convey your condolences. Simple and elegant, this bouquet of fragrant white lilies fresh from the fields will gracefully express your sympathies White Lilies and flowers in glass vase 3.. In a last way to say how much you appreciate her/him in life and proving you will never forget this fabulous memories, this sensitive sympathy will represents your feelings. Item: Wreath in sympathy (models may vary) ..
Yellow and White Wreath to Brazil, seasonal funeral flowers Brazil. 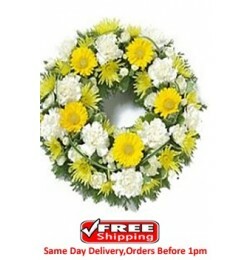 This Yellow and White Wreath is comprised of assorted quality flowers and available for delivery to Sao Paulo ..